From October 23rd lucky European DSi fans will be able to get their grubby hands on not one but THREE new shades of their favourite console. 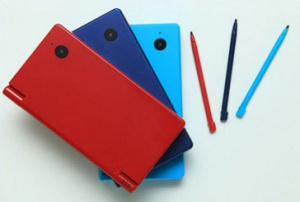 Perfectly complimenting the current black and white editions, the new DSi colours are Metallic Blue, Light Blue and Red. What's more, the new units will come pre-packed with the unique Facebook application and the superb Flipnote Studio. If you need reminding why Flipnote is the best thing since sliced bread then check out Corbie's review. As if this wasn't enough, you'll also score 1000 free DSi points when you connect to the DSi shop using the wireless connection. I dig that red one. Wait. That gawd awful light blue hasn't been available in EU since the get go like the US? Am I alone in disliking all the new colors? Oh well. the red looks cool but i still got my Light Blue and its awesomesauce but still awesome colors. That's good that Nintendo is installing Flipnote Studio and the latest firmware that fb photo uploaded by default. Australia just got a purplish/pink and another colour that escapes me right now. Imo black and white are the only ways to go when you buy a ds. I have a black DSi, but i'd sooooooo trade it in for a red one. The red one is very nice. I got the cyan one myself and I'm happy with it cause its more of a unique color. Although red is my favorite color....Hmm... Oh well. I don't live in Europe, no biggie. I wish that NA would have gotten the red one. Oh well guess we might see it next DSi update. That metallic blue color would match my armor and cassette deck so well! But I'm not European. And I have a black DSi. We got all the red we needed with the Virtual Boy. Wow, one of my subscriptions, TheNintend0Channel, has one. it's actually a glossy finish instead of a matte finish the normal DSi systems sport. Curse me for buying a black DSi when it came out!!! Ummm... Until my freaking 300$ total DSi dies, I AM NOT buying a new DSi. As much as I like the red and dark blue, I'll keep my 100$ in downloads thanks. Enjoy the awful light blue color. Wish we had white at launch instead of that nasty thing. Ah well, black is nice too. Wish you could transfer downloads and get a pink one. I like my black one though. I really want to know how they figure out what colors will do better in different regions and when to release new colors. All the randomness, it just doesn't make sense. Why can't we who love our DS's and bought one early have some choice too? FINALLY RED! I am At 90% won over factor. Now if only this small issue of DSI exclusives being region locked hadn't arisen. I kinda like the light blue one. Makes you wonder if Nintendo of America will have the red and metallic blue colors coming out in this region. Those in the US that want these colors, send out a message to Cammie Dunaway about it. She's the VP of sales and marketing at their company. @grenworthshero: Damien comes from the land that created the word "colour"
Does anybody know when these are coming to Canada? ?